Ongar the World-Weary, a Nord, is the first Thieves Guild fence that will be available to you after you have joined the guild. He is retired from active guild duties and spends his leisure time offering illegal bartering services in his hometown Bruma. Ongar has the lowest mercantile skill of all the fences and some cheap items for sale. He always has a supply of 100 lockpicks, which will restock every three days. He is available all day, except when he is outside. Because of his current profession, Ongar lives a quiet and discreet existence in the snowy town of Bruma. Retirement or not, old habits die hard, and he still goes to sleep early in the morning, at 6am. After waking up at noon he immediately ventures outside for a quick two-hour breakfast at his favorite inn, Olav's Tap and Tack. At 2pm he heads back home and wanders around until 6pm when it is time to visit the inn once again. Here, he will spend a whopping twelve hours in the company of innkeeper Olav and the many Nord regulars. At 10pm he goes hungry and may go into sneak mode to obtain some food, a phenomenon that may cause a bit of trouble with the guards. If he finds any, he will find a seat and enjoy a late two-hour dinner. Between midnight and his bedtime, Olav will be the only person left at the inn, so Ongar will just stroll around until he returns to his house and finds his bed at 6am. Ongar wears a set of discreet lower-class clothing, including a pair of coarse linens with a collared shirt and a pair of stitched leather shoes. He wields an iron dagger and carries his house key and a leveled amount of gold. When you meet him for the first time, before having joined the guild, he will act innocent and politely introduce himself: "Ongar the World-Weary, they call me. I've been everywhere, and done everything. Now I'm settled down for a good long rest." 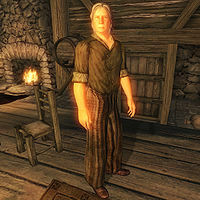 When asked about Bruma he will respond: "Bruma is a perfect town for a Nord man of leisure. Bracing mountain air, good food and drink, and lively Nord fellowship." If you try to barter with him at this time he will, like all other fences, deny you his services. After you have joined the guild, his greeting will change considerably: "I see you are with the Gray Fox. Do you need a fence?" After you have finished selling him your stolen items, he will lazily say: "I'm glad that's done. I need a nap." The next time you approach him, his greeting will be different: "I'm really tired. Can we get on with this?" If his disposition towards you is above 60, he will use a unique welcome message when you barter with him: "My favorite customer! Whaddaya got?" Due to him living right across the street from Jearl, Ongar will also prove helpful during the Spies quest. When asked about her, he will reveal: "Well, since I like you ... I think there's somebody staying with Jearl. Never seen 'em, but I've heard her talking to someone, and I've seen somebody at the window when Jearl wasn't home. None of my business, but since you asked ..."
Esta página foi modificada pela última vez à(s) 06h11min de 30 de julho de 2013.